Any target? Ok. I hit it dead center. Twas kind of hard to miss. I just wanted to say that I like the way you've named the files to give so much information - makes it easier to find something in the future. I think I'll start to do it that way from now on. 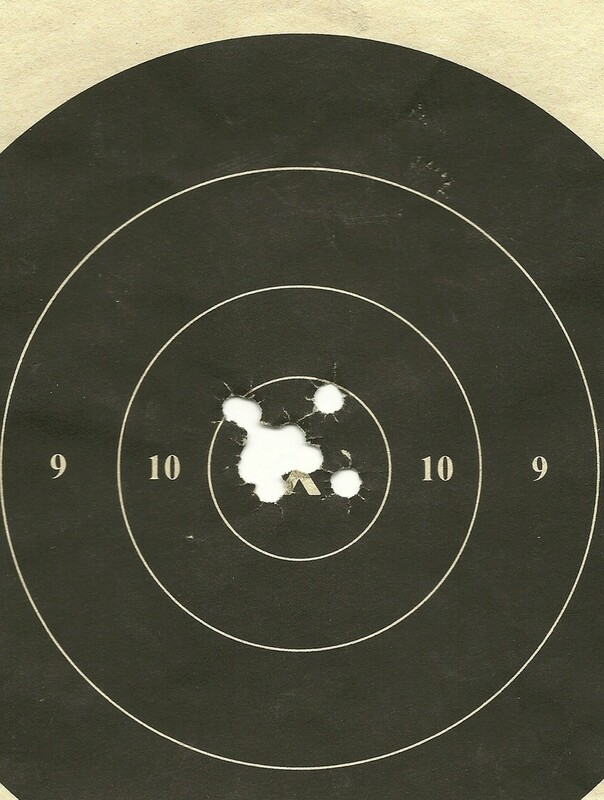 Glad you had a good day at the range! Now Roddy has modified the pistol into a wad gun. 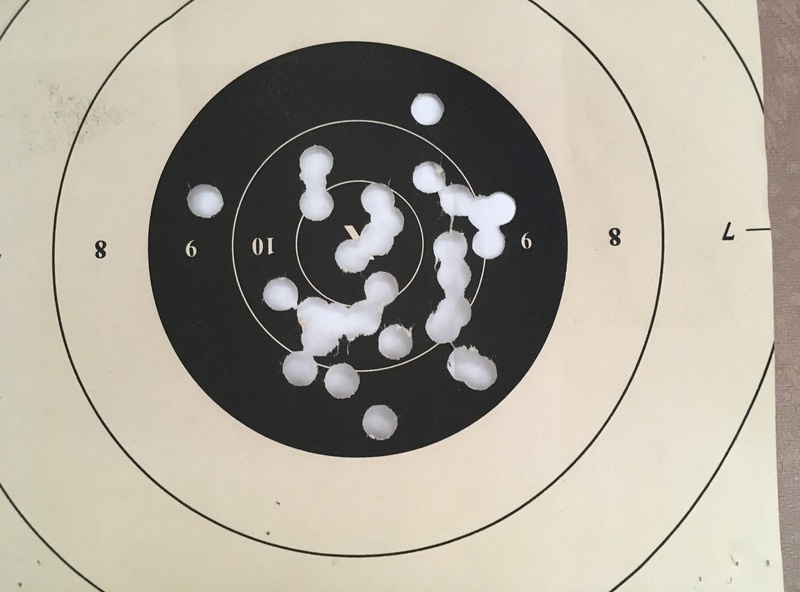 If 45 practice slow fire 25 yards. I seem to be getting better. But the wrong distance might affect my chances at "correct" distances. 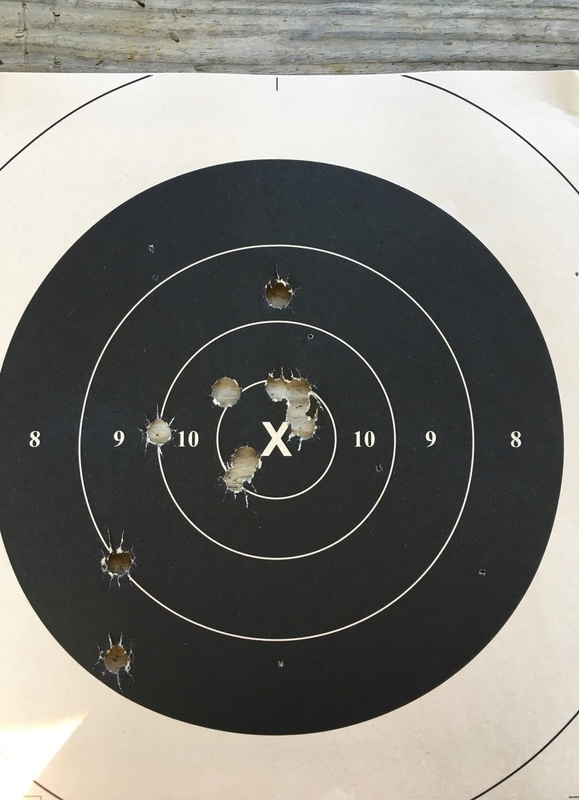 I just run the targets out to the maximum of the range, there's no way to measure accurately otherwise and the target lighting is only really good much closer or at the far end. But I guess shooting at a further distance might make things better for me if I ever actually compete at regulation distances. Or it might make things worse considering sight adjustments. Until my groups are consistently tight though, not much of a worry. Wes, Welcome! Or should i say, Welcome back "Guest"? You're in the right place to get information to work on the fundamentals, then you'll enjoy watching the scores go up. I'll have to look to confirm it, but if I remember correctly some of my early targets looked similar to yours. 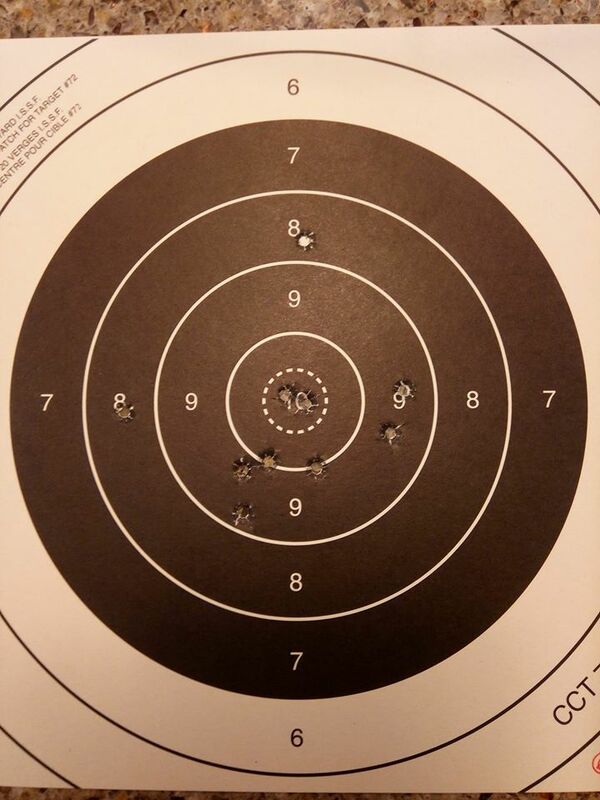 Its not a target, but it is one of my better sustained fire performances in a 2700 aggregate. 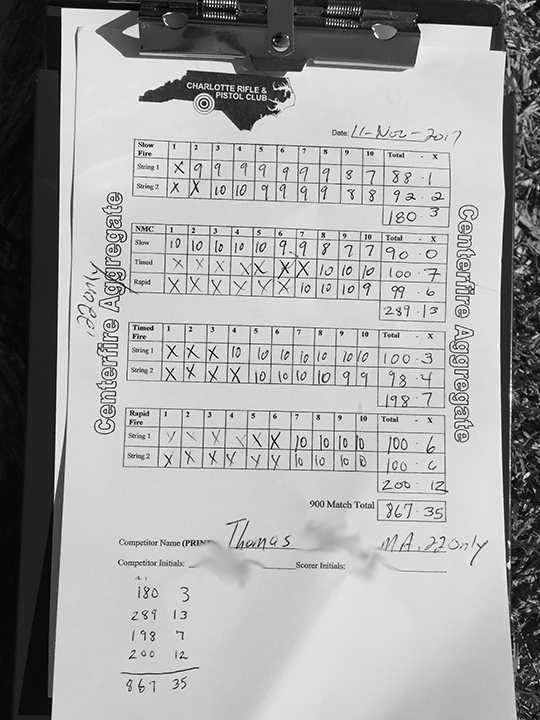 Dropped 3 points out of a possible 600. A 3-point shortline is nothing to sneeze at. Well done. 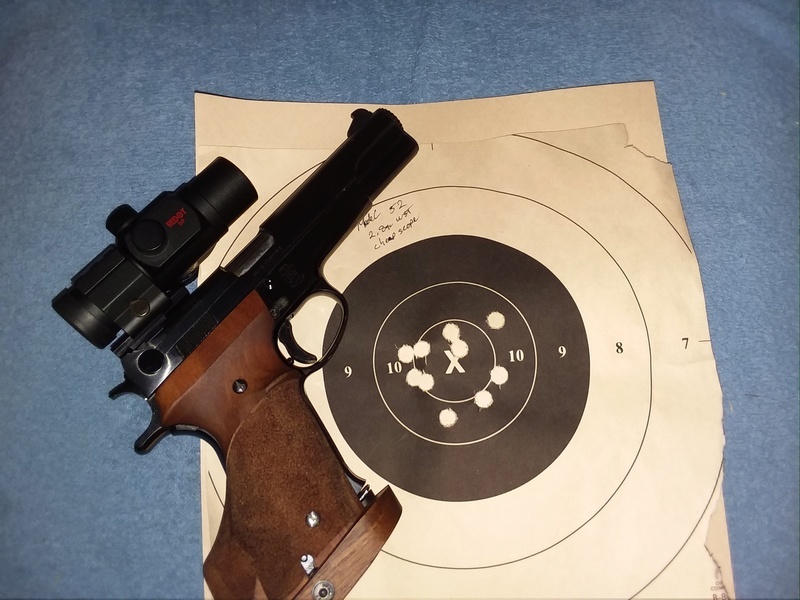 I'll play, mine is a 566/600 on a regulation 10m target using my Steyr Evo 10 with a Vortex Venom red dot, its my best air pistol score, iron or dot. 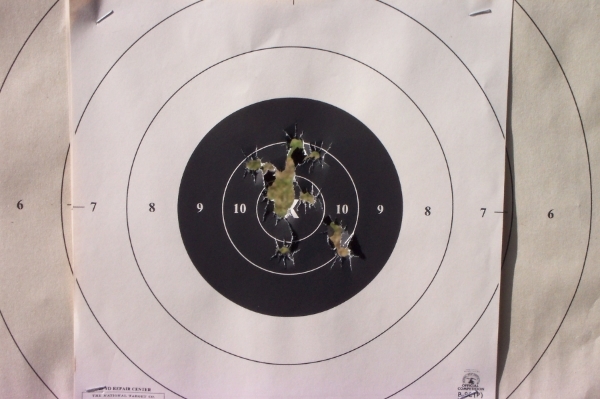 This is a 25 yard timed / rapid "9 ring training target" shot this morning. First time serious with my new to me Benelli MP95 in .32 wadcutter. I'll take it! Looks to be about a 95? Morning pellet gun practice. It has a 7-pound trigger pull and an inch of trigger creep. It's like weight lifting in preparation for my Victory with its 2.5-pound trigger weight and no creep. Chris, where do you shoot with electronic targets. One of those sure would be fun in my basement. Is that the new setup at Perry? 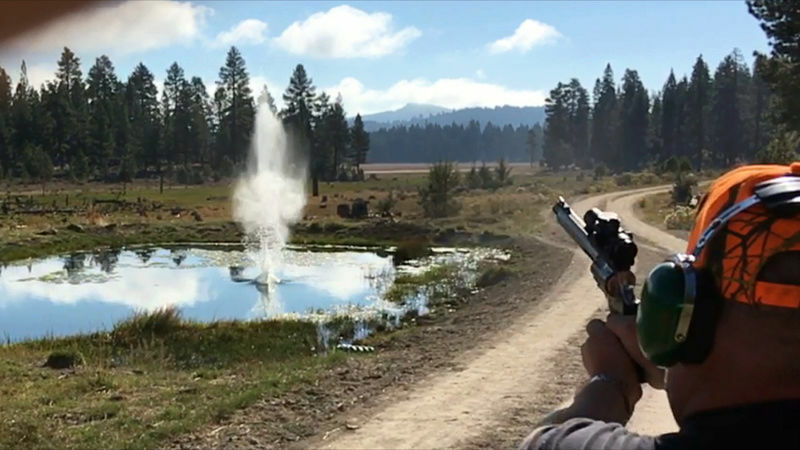 When you shoot like that the electronic targets make all the difference in the world. Cranking 60 paper targets feels like more work that the 60 shots. This was at an air range down the road from me, 25 points the club bought the old Cmp electronic targets. It’s usually full on open days from high school rifle shooters ....I guess they can’t get enough on their school day at the range. Good for them. our local AP club in Griffin Ga got the same targets from the CMP when they upgraded.. I really like them for AP but not so much for BE so far based on my Talladega experiences. I don't miss cranking the targets back and forth..
25 foot NRA Slow Fire. 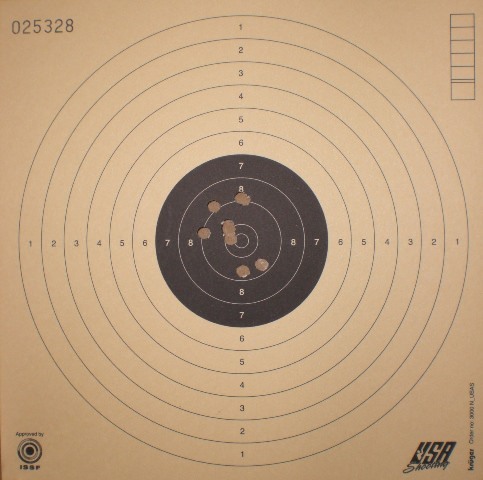 I put all of my targets saved with a camera on a web page. Shot with a Steyr EVO10 (mechanical trigger) and RWS Meisterkugeln 4.50 mm pellets (not that these details matter that much). I shot this today as an experiment. 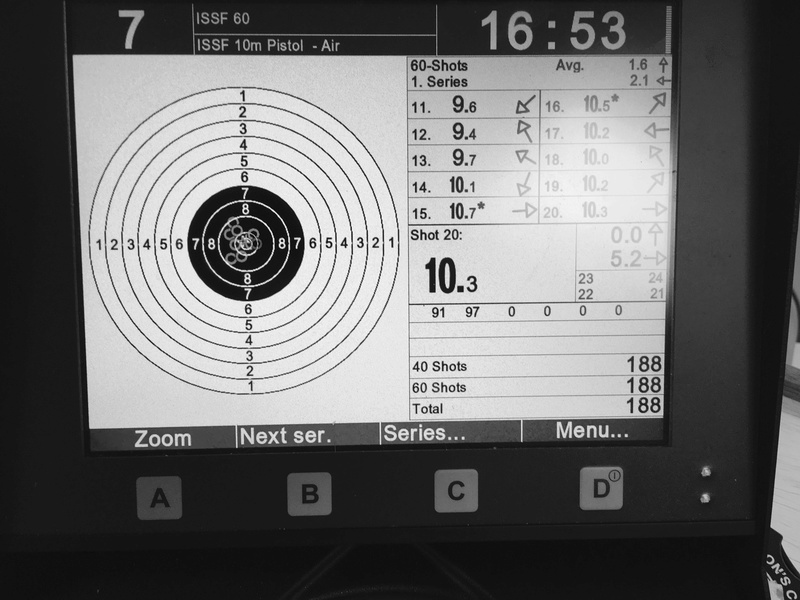 Fired at 25yd not really SF and not really Timed. Sort of a take your time timed fire. It was raining hard enough I wasn't going to spend all day there. I wanted to test a different mounting style on the 52 and all I had to plop on it real quick was a cheepo Millett 30mm. Sort of makes me re-think the cheepo part. The 52 started throwing shots off call on the last match (had to switch guns) and I didn't know if it was the base or the Holosun. I think this eliminated the base as the problem. To be fair I will mount the Holosun on a different pistol sometime and see if it holds zero. Len I have 3 of the "cheapo" Millets with the ajustable dot size. The oldest one probably has 5000 plus 45 wad rounds through it and it still holds zero. Can't beat them for the price as far as I am concerned. Hardball rapid. Back when I was chasing legs. Practicing way more than I do now. Real Hardball BTW, with the same Roddy gun of the test target above in this thread.